Van without wheels. Feltham, 1981. © Derek Ridgers. This may look like a van with no wheels but to me it was an epiphany. I was prostrate, stripped to a pair of shorts in a corner of the car park of Feltham Swimming Baths at the time, so it was an odd position to be seeing the light from. But it was at just about that moment, whilst I was taking that photograph, that I came to realise that I didn’t really want to be doing that sort of thing anymore. By “that sort of thing”, I mean advertising photography. At that moment, I realised that, other than financially, it was never going to amount to a particularly sensible career aspiration for me. It was in August 1981 and it was only a few months after I’d left work at the London advertising agency Royds, where I’d spent the previous three years working as an art director. Though I say “left” that word isn’t exactly right. I was fired for reasons which, even now, I’m not completely sure about. But it wasn’t the first time I’d been fired from an advertising agency, far from it. In those days, employers never needed much of a reason. Especially in the rather cut-throat advertising business. Thinking back, it might have been because I’d elected not to work on the apartheid era South African Airways account. I don’t honestly know. I’d worked on quite a lot of successful accounts at Royds and I thought I’d done very well. But refusing to work on the South African Airways account may have upset the ultra-Conservative (with a cap C) chairman. I thought I had a choice but maybe I really didn’t. A few weeks later they just said “we’re going to have to let you go” and that was it. I really enjoyed working as an ad agency art director. At times, it really was a bit like the TV show Mad Men. But with a lot more emphasis on the mad. In the context of 2011, some of the habits and working processes of ad men of the time would seem totally certifiable. Even then we realised much of what we were getting away with was a little excessive. Hugely enjoyable but certainly excessive. But, after ten years, a little voice in my head suggested that maybe I’d be better off out of the ad world. And besides, if you’re in the creative department and you’re not at, or near, the top by the time you’re 30, you’re rapidly reaching your sell-by date anyway. But my sacking came at a perfect time in my fledgling photography career. I’d just had my second one man show (‘Skinheads’ in the Autumn of 1980) and I was getting my work into print fairly regularly. Plus many of my advertising friends said that they’d give me some photography work, if I decided to try to make a career out of it. And so, a few months after I left Royds, one of my old colleagues called me in and asked me to take a photo of a van with no wheels. They showed me a few layouts and said it could be any van, just as long as it had no wheels. They didn’t want anything much in the background either. That was all. It seemed simple enough. So that’s how I came to be laying down, half naked, in the grit and grime of Feltham Swimming Baths car park. It was the only place I could find near where I lived that would allow me to take a photo of the van without too many buildings or trees in the background. It seemed like relatively easy money, so I hired a van and four car stands and set about the task. Anyone who’d been watching me that day whilst I did that shoot would have seen someone drive in and park a rental van in the emptiest corner of the car park. Then they’d have seen them jack up and remove all four wheels, remove most their clothes, (it was an extremely hot, humid day) and then go and lie down on the ground about 40 feet away take a few photographs of the wheelless van. 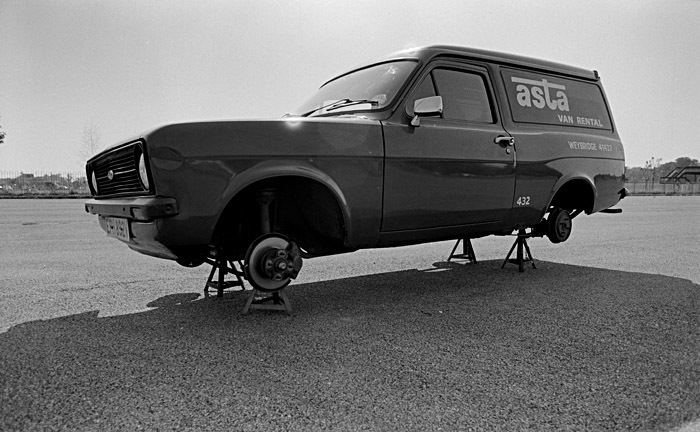 Then then they’d have seen that person put the wheels back on, get dressed and drive off…. Anyone watching might have thought it seemed crazy. As I was laying there sweating, with car park grit sticking to my chest, elbows and legs, it started to dawn on me that maybe I didn’t want to be an advertising photographer after all. I didn’t have an assistant in those days (it would be nearly a decade before I had one) and it simply didn’t occur to me how much stress and bother I would have saved if I’d simply hired an assistant for the day. That is what photographic assistants are for, after all, to do the hard stuff, so you don’t have to. But this was the moment I decided that that kind of photography work just wasn’t for me. The guys at the agency seemed pleased and the ad itself turned out surprisingly well. But it wasn’t the kind of photograph anyone dreams of taking and if it wasn’t for this blog, this photograph would have been forgotten by all concerned three decades ago.